Pocatello, ID. 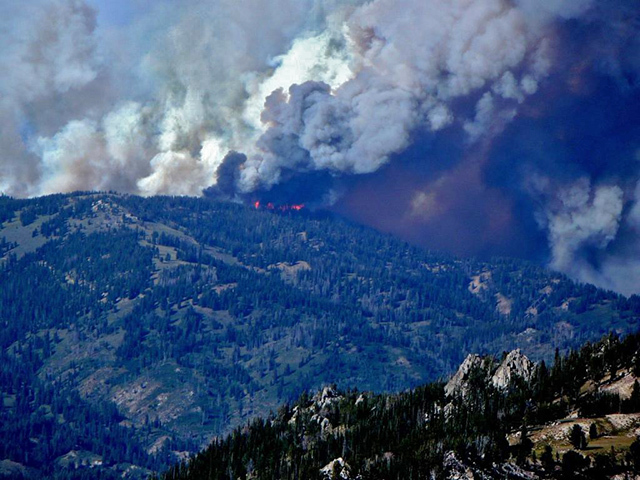 As we reported earlier, more and more wildfires are breaking out in Idaho. It is August and most are due to lightning torching the dry forests and brushlands. The smoke generally blows eastward across the state over into Wyoming, Montana, and northern Utah. Here in Pocatello in SE Idaho, each day has brought more and more smoke, most of it is high, crusing well overhead like a stream of high clouds. It comes from fires nearby, but also as far away as Oregon, Nevada, and California. Last summer, 2011, which was very wet, was a welcome respite from August’s smoky skies. The three major Idaho fires presently in Idaho are Halstead (there was an earlier post); Cave Canyon, and Trinity Ridge. Since our August 5 report, this hot burning forest fire northeast of scenic Stanley, Idaho has grown from 25,000 to 37,000 acres. It has burned to surprising elevations out of the buggy and dead lodgepole pine into old age mostly green sub-alpine fir, Englemann spruce, and threatened whitebark pine in the upper portions of Trail, Loon and West Fork drainages. It is burning around some sub-alpine lakes and threatening to jump passes leading downhill into other major drainages such as the West Fork of Yankee Fork. A major goal has been to keep the fire from crossing Idaho Highway 21 that feeds the Stanley area from the west, but just now it is reported a brand new fire, the Bench Fire, about 20 miles to the West has closed that highway near Banner Summit. Current expectation is the fire will not be contained until mid-October! 390 people are currently working the fire. Lastest from inci-web. This fire was started by UTV, a big ATV in a far backcountry area where conservationists had tried to keep out timber roads for taxpayer-subsidied logging. The fire started on Aug. 3 and has now ballooned to 24,000 acres threatening to burn down into the Middle Fork of the Boise River. There are few obvious barriers to expansion except a few old burns and the rocks of the Sawtooth Mountains to the east. Because of the fire’s large growth potential, recreation has now been closed on 300,000 acres of the Boise National Forest and all tourists to be evacuated from the remote town of Atlanta, Idaho. Update: At the end of 8/9/2012 the fire has grown to 30,000 acres and reached down to the edge of the Middle Fork of the Boise in places. 8/10. It’s now across the Middle Fork and burning up the other side. Trinity Ridge fire on Inciweb. This combination brush, grass, and timber fire was started by lightning August 5 and very quickly grow to 31,000 acres (now 45,021 acres, big run to the north) under hot skies, gusty daytime winds and strong downcanyon winds. It is burning in the South Hills west of Oakley, Idaho on the Cassia District of the Sawtooth National Forest. This is in that part of the Sawtooth Ntional Forest on the south side of the Snake River Plain. It is about 15 miles SE of the city of Twin Falls. The South Hills are a complicated uplift presenting some deep basalt canyons, e.g., Cave Canyon, plateaus, and intricately dissected low mountains with many springs in places. The fire has shown extreme behavior and has great potential for growth. It is burning some rare, precious sage grouse habitat and some downed thick timber. Numerous efforts have kept it out of the agricultural valley at the base of the Hills’ east side. It is burning in all directions. Update: the popular Rock Creek road is now closed and the forest recreation area on top of Hills being evacuated. 8/10. Later on 8/10, the Cave Canyon fire is now 80,000 acres !! Because other fires are breaking out in the Hills and adjacent areas, Inciweb will report the news on this fire from now as the Minidoka Complex. The Magic Valley news has a rundown of these three big fires and numerous lesser fires in southern, south central Idaho. From Stanley to Oakley, Fires Continue Spread across Region. However, this is not the entire roster. Fires burn here and there in Eastern Idaho and get little attention, except the month-old Charlotte grass and juniper fire that burned part of south Pocatello, including 66 homes, friends’ homes included. There is also a complex of fires from lightning just getting underway on the tops of the remote and rugged Salmon River River Mountains, just north of the Salmon River, about 25 miles NW of Salmon, Idaho. It is the Mustang complex. My little valley has been socked in from smoke for the past few days, coming from fires in Idaho. Thunderstorms w/alitle rain, moved in late morning (and are active right now) so its a sure bet, planes will be up and searching for lightning strikes over the next couple of days because its so dry here. It’s been the same further south along the Madison, sometimes you could barely see the clouds overhead due to the smoke. Had a good soaking rain early in the evening last night but I’m sure there were some lightning started fires to be found. it’s also been oppressively hot this past week. Over by the east gate of YNP there was a landslide caused by torrential rain this morning that closed the road just outside the park on the way to Cody, WY. HIGHWAY 14…16…20 EAST OF YELLOWSTONE PARK HAS REOPENED AFTER A MUD SLIDE THAT OCCURRED EARLIER THIS MORNING CLOSED THE HIGHWAY IN PAHASKA ABOUT 2 MILES EAST OF THE PARK DUE TO A FLASH FLOOD. THE THUNDERSTORMS THAT CAUSED THE MUD SLIDE HAVE MOVED WELL TO THE EAST AND AWAY FROM THE AFFECTED AREA. There is a good satellite map in animation now that actually shows the bulk of the high level smoke along the Idaho/Utah border is coming from fires in northern California and maybe the big Hollaway range fire on the Oregon/Nevada border. Which map is this, Ralph? I may postpone my trip until October because of the air quality and photogenic quality. Ralph, is there a URL for that? Holy cow! 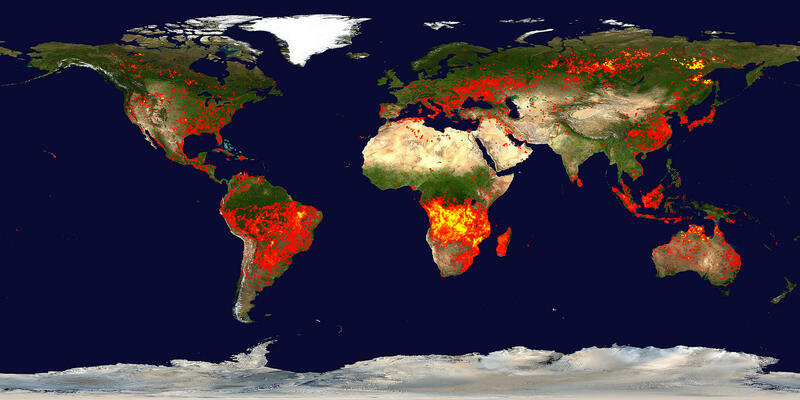 I decided to continue searching and I found this map of fires detected by satellite over the week of 7/29 – 8/7 (most recent available)… we’ve got, basically, nothing happening compared to most other land masses on the planet… Yikes. What about the toponce fire? Any info there? I can’t find anything on Toponce Creek, Id… if that’s what you’re referring to. The maps and data sources that I use didn’t show any fire activity there or anywhere near there. It’s the “go to” web site that my smokejumper friends use to check on fire status when they’re at home. As predicted the great controversy since has been how will the area be rehabilitated and when will cattle be let back on the burn — too soon it appears, much to the discredit of the BLM. Also, there isn’t enough good (meaning native) seed to reseed where they want to accelerate regeneration and prevent spread of cheatgrass. They will be using crested wheatgrass and forage kochia. These are not native species, though the BLM has long been fond of crested wheatgrass even though cattle and wildlife don’t like it, and it fails to retard range fires. Cole reminded us that crested wheatgrass is high is silica and so it is coarse. I know from my experience . . . the stuff just stands there until it’s knocked down by the weather or by fire.